One sign of a competitive league is when a team that ends the season in the bottom third one year can manage to end up in the top third within the next three years… Basically, you have about one chance in three of having at least one competitive season in the next three seasons, if you finished in the bottom third of the league in standings. Let’s call this “The Rule of 3”… My question: who wants to try this exercise for NFL, NHL, and NBA? Well, since I already had the data I volunteered to answer that question. The following table is based on teams from 2000-2007, measuring their upward and downward mobility three years hence. As you can see, baseball is the laggard again. However, unlike the graph above, these data show that the NHL is just as mobile as the NFL, and the NBA isn't far behind. If I were tempted to jump to conclusions, I would suggest that this says a lot about the importance of playoff attainability and salary floors regarding competitive balance. First reaction: hmm, isn't this more of a reflection of the fact that baseball teams play 162 games a year in the regular season while NFL teams only play 16? Upon reflection: this is something you have already pointed out in the last article. Genuine question: so is there any reason that I am missing such that you can ignore this disparity in this particular case? Looking at your other article, it seems to me that correcting for the number of games played by comparing 10 NFL seasons to 1 MLB season would still be unsatisfactory because it ignores the fact that the strength of a football team should be expected to fluctuate over 10 seasons much more than a baseball team over 1. If we assume that a team's strength does not fluctuate over the course of a single season, then the variance in number of wins for NFL teams over 10 seasons has got to be the variance in wins across teams + variance of wins of a single team across 10 seasons, right? You're not missing anything. 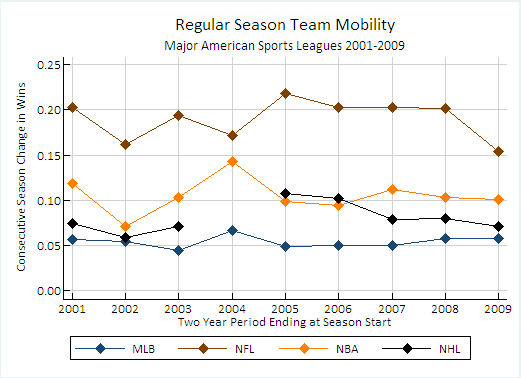 I've addressed this question in this series and others have from around the web, most notably here: http://www.chancesis.com/2010/10/20/the-distribution-of-talent-between-teams/. This post was about answering a specific question posed by Tom Tango. No problem. Thanks for asking.